. . The MOAB 10 (Mobile Operation Attachment Bag) is part of the RUSH series of premium quality gear packs from 5.11 Tactical. A high performance tactical go. . bag with room for everything, the MOAB 10 gives you plenty of room for gear and accessories while offering extensive modular storage expandability that. . allows you to determine how your kit should be organized. The ambidextrous padded strap is fully adjustable, while a coms pocket at the shoulder provides. . pass-through access for headphones. A covert pocket at the rear is Backup Belt System™ compatible and large enough for a sidearm, while an internal water. . bottle pocket includes a pass-through port for easy hydration. The interior storage area provides ample space and a variety of admin pockets for optimal. . organization, and an extensive MOLLE/SlickStick™ compatible web lining around the exterior allows you to build your storage structure from the ground up.. . When you need to expand your storage capability for longer operations, the MOAB 10 comes equipped with the 5.11 Tier System, allowing you to integrate the. . MOAB with other RUSH series bags.. . 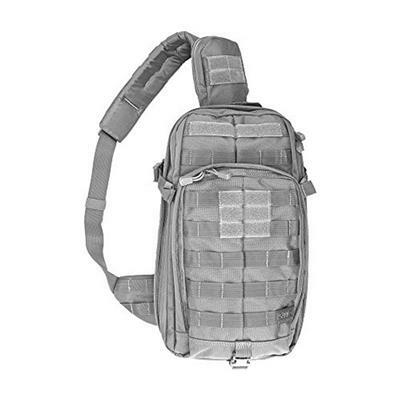 Fully customizable tactical go bag. . Adjustable cushioned shoulder strap. . Coms pocket at the shoulder. . Covert Backup Belt pocket at rear. . Secondary double zip pocket. . Hydration pocket with pass-through port. . Roomy, organized storage area. . Multiple interior admin and stash pockets. . MOLLE/SlickStcik web platform exterior. . Fleece lined sunglass pocket. . Sturdy grab handle. . Comfortable compression straps. . Sturdy, lightweight 1050D nylon. . Water resistant. . 5.11 Tier System integrates with other RUSH bags. . Main compartment: 18.25” H x 9” L x 5.25” D. . Front compartment: 12.5” H x 8” L x 2” D. . Coms pocket pass-through cord slots. . hook and loop fastener flag patch. . YKK® self-healing zippers. .